It's time for Alphabe-Thursday sponsored by Ms. Jenny over at Jenny Matlock's Alphabe-Thursday. This week we are studying the letter "K", as in Kalamazoo. Yes, there really is a Kalamazoo! Let me tell you my Kalamazoo story. Back in the early 90's my husband and I planned to take a cruise to the Caribbean. We were scheduled to fly to Florida on a Sunday in March; however, the National Weather Service was predicting a "blizzard" and winter weather was rolling in. The day before we were to leave, snow was steadily falling and the winds were howling. As soon as we learned the local airport was closing due to the impending storm, we packed our bags and off we went. Luckily, we were able to catch a flight with a connection through Pennsylvania. While flying over Pittsburgh the pilot announced that airport was closing and we would be diverted to somewhere in Michigan. Obviously, we were not headed for Florida! 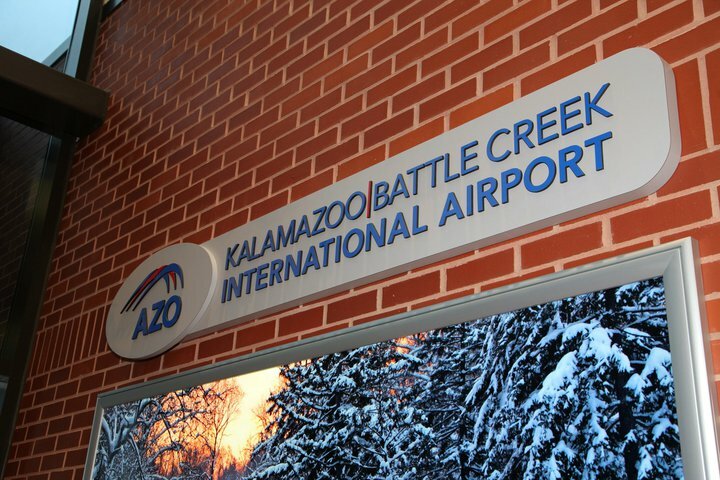 As we departed the plane I was shocked to see a sign that read "Welcome to Kalamazoo". If you don't already know, Kalamazoo is in the middle of nowhere! The pleasant lady working at the ticket counter told us if you want to get to Florida you first have to take a shuttle flight to Detroit. My husband and I just looked at each other in dismay. After waiting all day we finally caught a flight to Detroit and then onto Florida. I'm sure there were a lot of "cool" things to do in Kalamazoo, but we didn't stick around long enough to find out! This snowy owl seems to enjoy the place. He is ready to fly! Who would have ever imagined a blizzard in March! It turned out to be the "Storm of the Century" affecting at least 26 U.S. states and much of eastern Canada. Upon returning from our cruise we had 22" of snow just waiting to be shoveled from our driveway! So there you have my letter for this week - "K" for Kalamazoo. I hope you will stop and visit the other participants. Glad you made your cruse after all you went through! 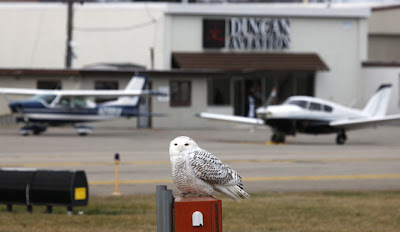 Love the picture of the snowy owl. Sometimes air travel can be a real adventure! Glad you got to go on your cruise. I'm not sure if it is the same story, but we had a storm here in 1993 that piled snow up so high my horses could walk right over the fences! Fortunately, they decided to stay inside where the food was! Beautiful shots of the owl ... I guess there are worse places to be stuck! So glad you got to take your cruise! I love the pictures of the snowy owl! They are so beautiful! Beautiful photos of that owl. Great story. And how cool to see the owl. Nice photos! Oh, what a frustrating trip! The only good thing is the wnow owl -a breatiful specimen! What a beautiful owl! It sounds like a tough trip! 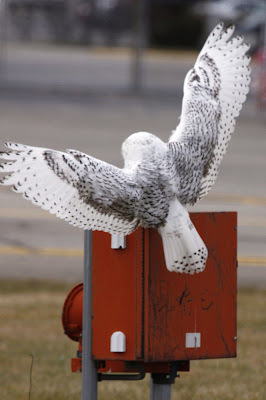 Those snowy owls are amazing...as is your story! Always good to be back home!!! Oh too funny! I actually knew there was a real Kalalmazoo just never been there or plan to, lol! Great pictures! Seeing the snowy owl and being able to take it's picture would have been enough for me. I love the Snowy Owl and have never seen one out of a zoo or protective area. How fortunate you were. I'm glad you did finally make your trip. How fun that you are so close to Clifton! I love the owl...we have had some in the area on their was north recently. They are fabulous! Great photos! Had to laugh when I saw you say Kalamzoo is in the middle of nowhere!! Being a Michigan girl I had to snicker. I can well imagine it feeling that way, especially at that time of year and with the bad weather going on. We do get some doozies in Michigan even in March! The winds are usually the biggest problem and Lake Michigan fuels it even more. I haven't seen a snowy owl in a long time but I've heard they are being seen throughout the northerly states a lot this year. They come to feed when their lemming supply is low, so I've read. Glad you made it out even if it took extra time! I'm sure your cruise was wonderful! Oh, and what great owl pictures too. I've always loved the name Kalamazoo and I've even been there a time or two. It's a great name to rhyme with but probably not so good to substitute for a Florida vacation! I'm glad you got to your destination safetly...eventually. Thanks for a kute post for the letter "K" this week. Wow, what a beautiful picture of the snowy owl! Everyone remembers the Blizzard of '93. It affected us here in the Tennessee Valley. We got almost two feet of snow and we even set the coldest spot in the USA the day after the storm with temperatures at -22. Great 'K' post!